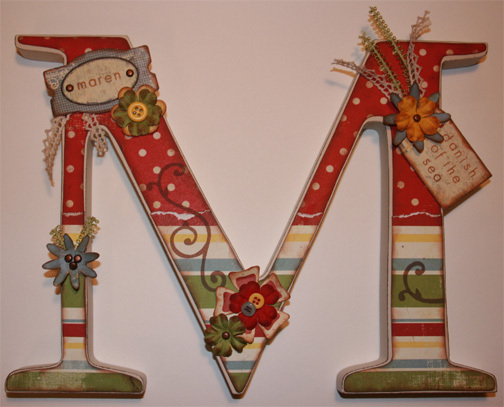 A wooden letter is a perfect baby shower centerpiece. It can be personalized to the baby's first or last name. Or you could use a "B" for baby. 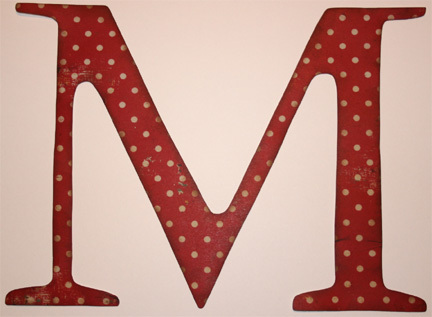 You can decorate your letter to match any baby shower theme that you may have. After you follow the directions below, you can display your masterpiece on the gift or food table as your centerpiece. Then you can give it to the expectant mother as a gift afterwards! Step 2. 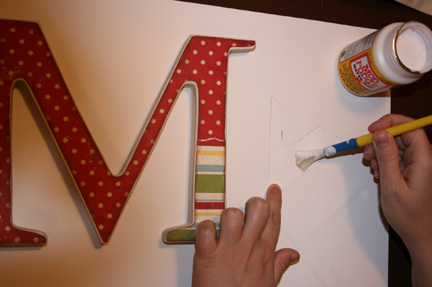 If letter is not already painted to your liking, paint the letter using paint and a foam brush. 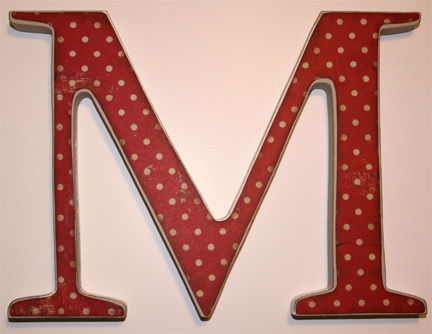 Once dry, sand edges of letter using sand paper, if desired (for a vintage look). Step 3. Purchase scrapbook paper(s) of desired color and design (ideally mimic colors and theme of baby's nursery). Purchase coordinating die cuts/tags for embellishments (unless you'd like to make your own from the paper scraps). Step 4. Purchase additional embellishments such as metal embellishments (brads, eyelets, spiral clips, etc. ), coordinating ribbon, paper flowers, buttons, etc. Step 5. Use an acid-free pen, alphabet stickers (with clear, vellum edges) or alphabet stamps to print the baby's name and the origin and meaning of the name on the embellishment tag(s). Step 6. Place wooden letter on top of paper you'd like to cover the face of the letter with. Using a pencil, trace around the letter onto the paper. Cut the letter out of the paper just a little bit to the inside of the traced lines (so the paper doesn't hang over the wooden letter edge). 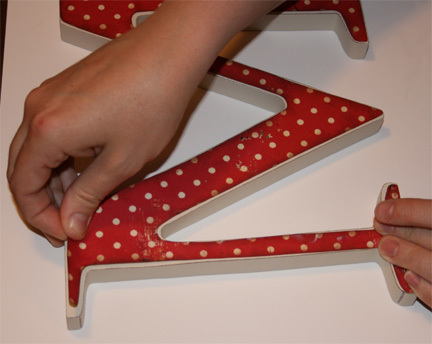 Then place the paper letter on the top of the wooden letter. Make any trimming adjustments to the paper if necessary. * Chalk the edges of the paper with a liquid chalk pad, if desired. (for a vintage look, use brown chalk). Step 7. 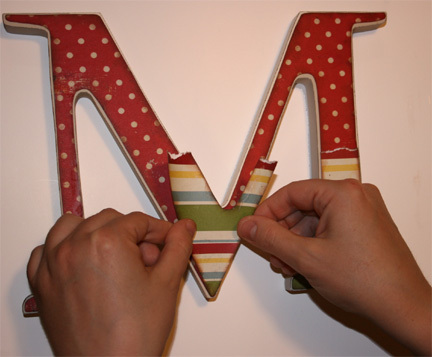 Use Mod Podge or craft glue to cover the back of the paper letter with a thin layer of adhesive. Apply paper to wooden block and smooth out the paper. Step 8. If a second, coordinated paper is also being used, trace part of letter that paper will adorn onto paper and cut out as instructed in Step 6. Tear edges of paper to create a boundary between the two papers on the wooden letter). Cover back of secondary paper with adhesive and layer over top of the first paper in area of letter you want to adorn. Step 9. 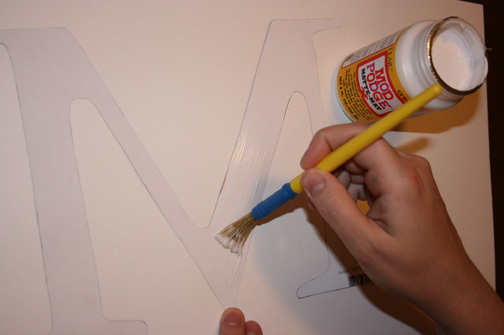 You can Mod Podge the face of the letter to give it a sheen and to make the whole letter smooth - brush a layer of this on and let it dry completely before applying embellishments (Mod Podge dries clear). If you use Mod Podge, you may not want to use stamps on the paper letter face, as stamp ink may smear. Step 10. 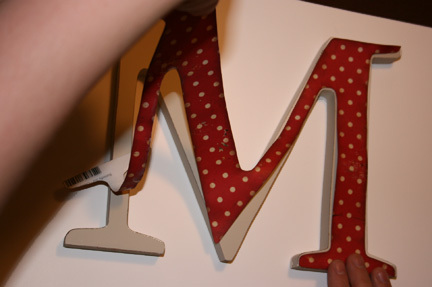 Using glue dots, a glue gun or other adhesive, adhere embellishments to the letter face. Use stamps if desired as well. (Buttons, paper flowers, tags, ribbon, lace and scroll stamps were used in this example). This personalized wooden letter looks adorable as a baby shower centerpiece AND is an perfect addition for the baby's nursery. 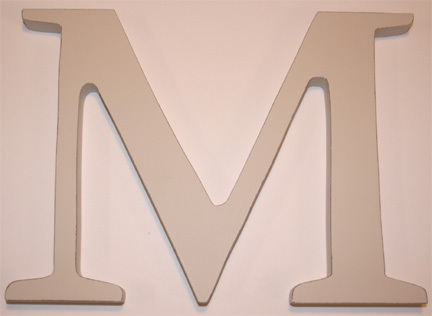 It's probably best to find out what theme the expectant mother is planning on for the nursery and decorate your wooden letter accordingly. Good luck with your wooden hanging wall letter! 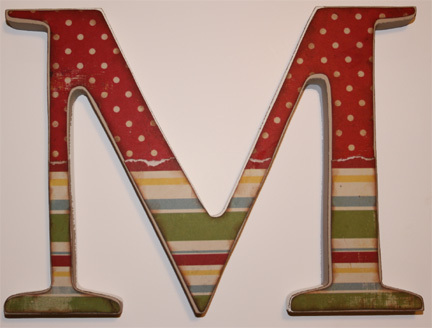 Send us a picture of your finished wood letter so others can see your masterpiece!